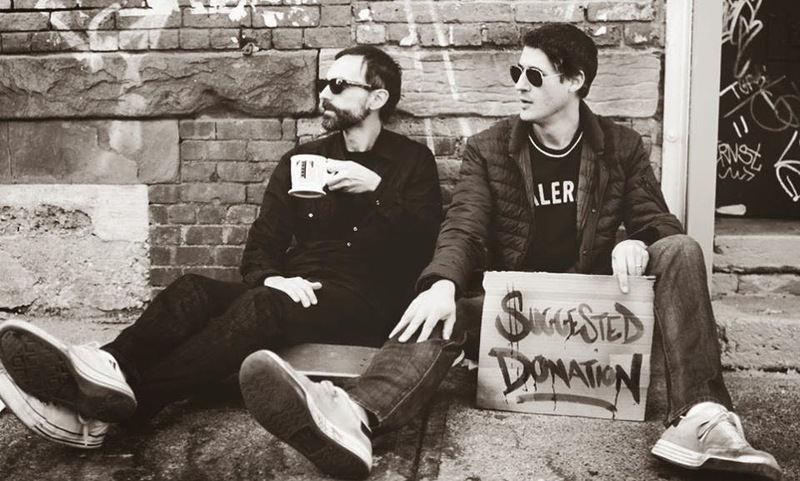 Painters Tony Curanaj and Edward Minoff talk art on this new podcast "Suggested Donation". Something to put on in the background while you work. I particularly enjoyed episode 2, with Graydon Parrish. Both Tony and Ted worked back in the days at MTV with me on Beavis, as well as a score of other projects. Ted headed up the Amp NYC Animation Studio, that produced some great work in the late 90's before heading into painting full time. Tony and I shared our Tribeca studio for a decade prior to my move to Singapore. 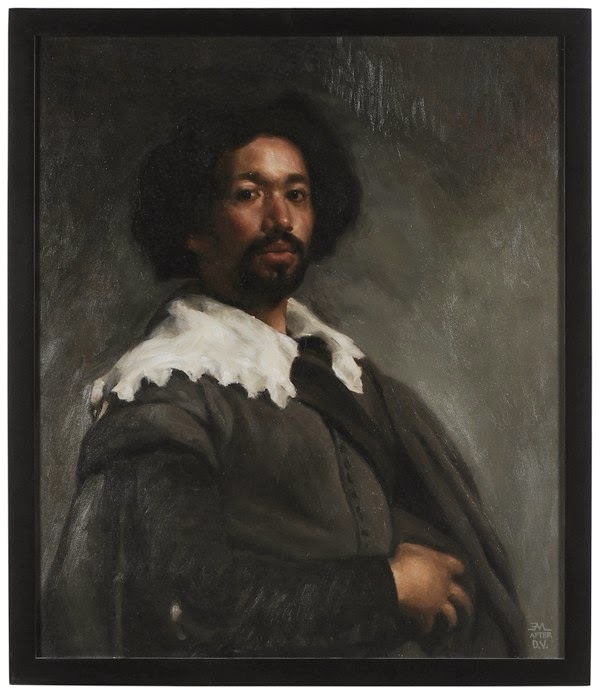 These two artists paintings are so refined and astounding that it forces you to consider every word they say. Enjoy. Exciting news! My new feature, CHEATIN', is finally screening in NYC! Yep! The film will have its NY premiere at the prestigious Friars Club Comedy Film Festival. They're going to screen it in the large New York Institute of Technology auditorium (1871 Broadway), so there will be room for everyone. The film has already won 5 international festival prizes and awards - so come and see what I've been working on for the past five years. Plus, everyone who comes gets a free drawing on a CHEATIN' card! 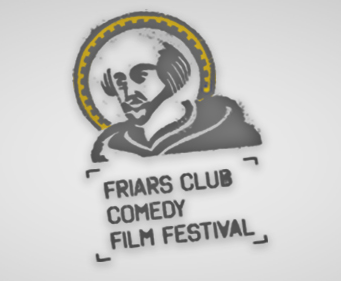 So I hope to see you all at the Friars Club Comedy Film Festival at 7:30 pm on Saturday, April 5!!! Once again I find myself going against my esteemed colleague. 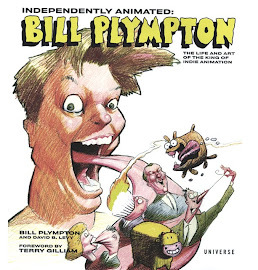 Please read his review below (which I have bumped up the date) Sorry it took so long to get to this review, the film has just been released here in Singapore, and I don't have anything that resembles the Plympton early access to these films. 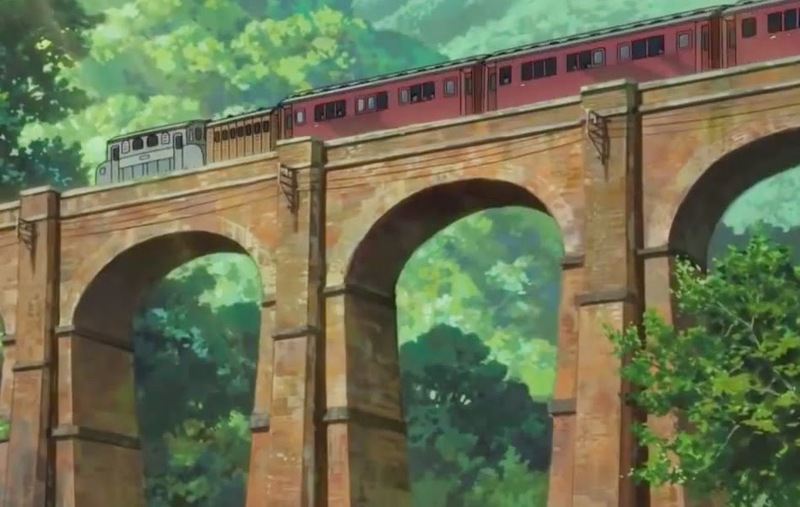 No disappointment here for anybody that appreciates the symbolic and emotional impact of Miyazaki's trains. 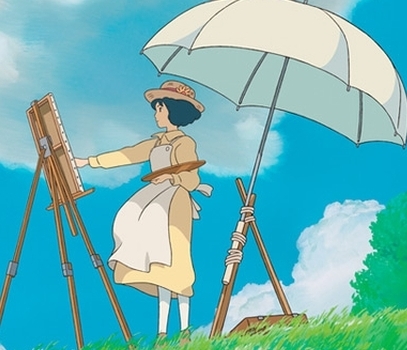 In the midst of the typical glut of gag driven, uninspired, and contrived Hollywood Animated Movies, comes a fresh Miyazaki masterpiece, "The Wind Rises." Finally released here in Singapore, I watched it last night and could not have been more pleased. 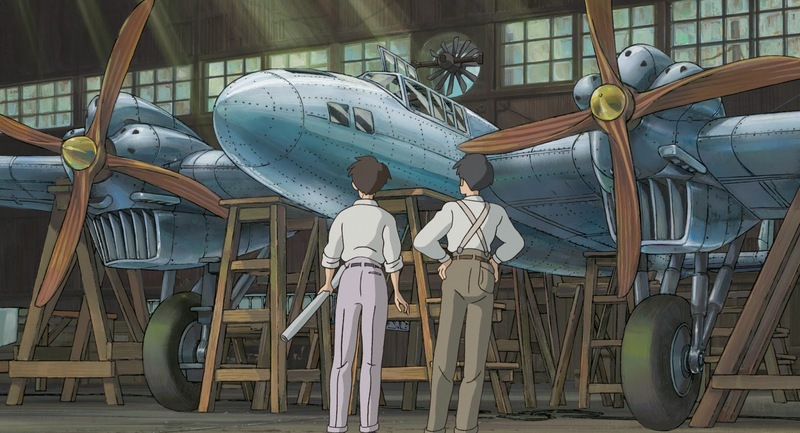 The artwork of the trains alone is worth a glowing review, but this is topped off by the interesting story about Jiro, the famous designer of the WW2 fighter plane, his ambitions, the state of Japan from 20's to the late 30's, and lastly a poignant (yet historically fabricated) love story. The contrast to other animated movies was set perfectly and immediately by showing a handful of trailers for upcoming animated movies, including Rio2, which promises absolutely nothing outside overly timed gags, cliches, and tired parody. I was expecting to see a matrix slow motion shot in there. 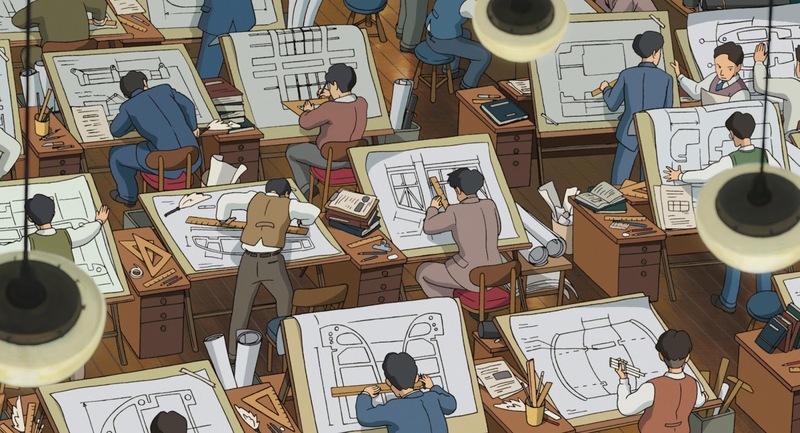 Jiro's love story with Nahoko serves the story well, giving the work obsessed airplane designer a distinct humanity. Where other animated features rely on quit hit gags (even if they are funny), celebrity voices, and ridiculous broadway antics (that I think nobody ever enjoys), The Wind Rises is held up by sweeping panoramas, patient timing, smart storytelling, and sincere characters and acting. Everything about this movie screams sincere! You get the feeling that you are being treated as a very intelligent person, a very engaged person, one who is ready to be told a great story with fantastic imagery to match. Some of the artwork was literally breathtaking. There's plenty of caricature and cliches, but they are used effectively as a story telling tool, and not sloppy fuel for a throw away gag engine. Jiro studies an imagined wreck of his dream. 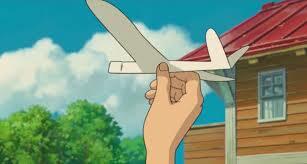 Many of the most effective scenes in "Wind Rises" were dream sequences. 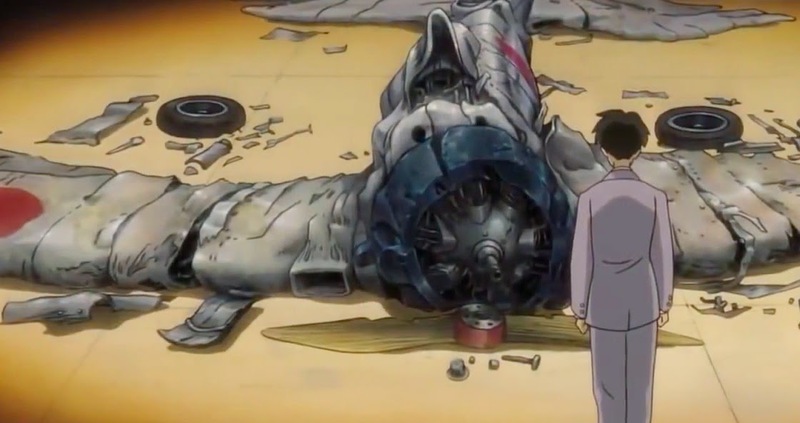 There are subtle moments in this film that I think are the greatest achievements of not only Miyazaki, but of the animation medium. 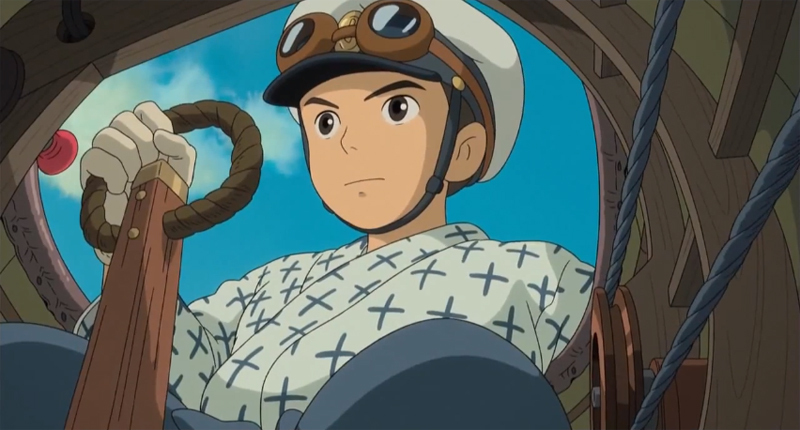 When the main character, Jiro, looks into the distance as his prized ambitions are flying directly in front of him, the viewer understands the drama of the moment, the subtle suggestion of the war saturated future and destruction of Japan. This type of subtly springs up time and time again in this film creating an overwhelming feeling of an impending force that the current story is contributing to. Compare this to some of the blatant "on the nose" approaches to his earlier work, and you can see just how far this auteur has come in his legendary film career. I've always believe that subtly is the mark of a great storyteller. For the audience to understand what is happening clearly, particularly within an emotional context, with a minimal amount of screen information is a truly a masterful skill. My other favourite Miyazaki film "Kiki's Delivery Service" uses many of the same wonderful forms of subtly and character sincerity. Any film that can make a little girl that rejects her grammas pie into a demon more horrible than any big gnarly monster is a result of a master. The Professor is happy to give this film an "A." I've just returned from an extended trip to Europe, 2 stops to publicize "Cheatin'". 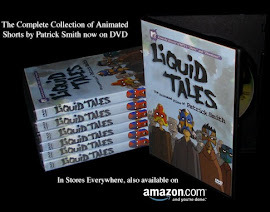 It's very important for me to go to Europe, because here in the U.S., it's more difficult to get distribution for an independent, hand-drawn, adult animated film. So I have to go where my audience is. 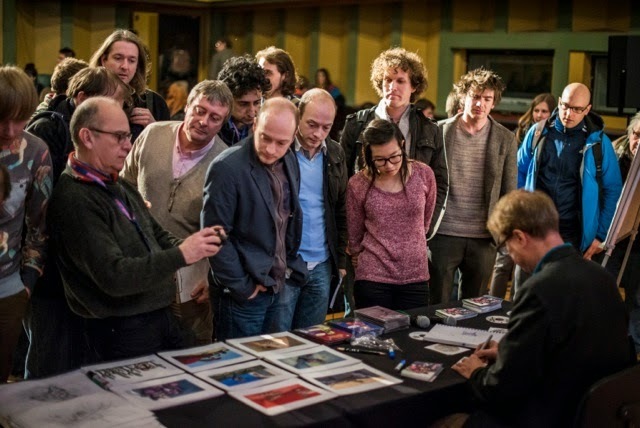 My first stop was the great Anima Festival in Brussels, Belgium. I've been going there since about 1988, and I've always seen great films and had a lot of fun. I have a lot of fans there because Brussels, as you probably know, is one of the hotbeds of comics (The Smurfs and Tintin). While at Anima, I gave a Master Class, with a drawing demonstration, and screened some of my most recent projects. But I was also there to check up on my competition. Anima is one of the best showcases for animated features, for both kids and adults. Although I was only there for 3 days this time, so I was only able to see one feature: "Lou Lou's Incredible Secret" by Eric Omond, adapted from a very successful book. I loved the style a lot, but I had difficulty following the story - my French is not so good. As for the animated feature category, "Frozen" was a lock - it was such a popular film and made so much money. It was no surprise, however it sure would have been great if "Ernest and Celestine" had won. Speaking of winning, "Cheatin'" won the BeTV award for Best Animated Feature at Anima! Next, I moved on to Paris, where I did publicity for "Cheatin'", or as it's called there, "Les Amants Electrique". I first met Jim Lujan through my good buddy Ken Mora in 2009. If my memory is still intact, I recall he came to interview me on one of my visits to L.A. - perhaps I was there for the ASIFA Hollywood awards show, The Annies. 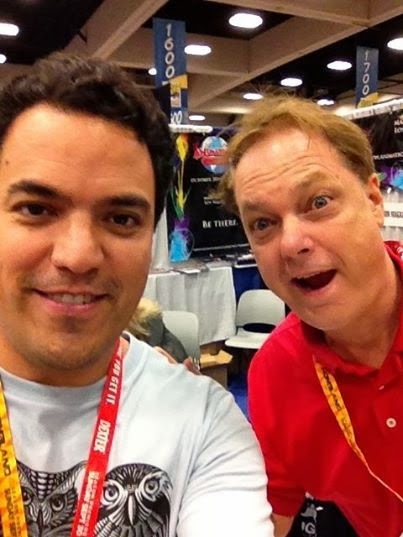 Last year, when I was at the San Diego Comic Con, he had a booth and we hung out. Then, on my return flight, a wonderful thought occurred to me. 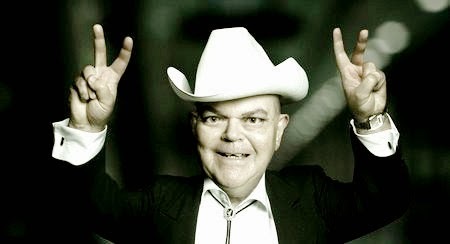 His characters are so funny and original – Jim Lujan should do a feature film – and I could be the one to produce it. Hell, we should co-create an animated feature. 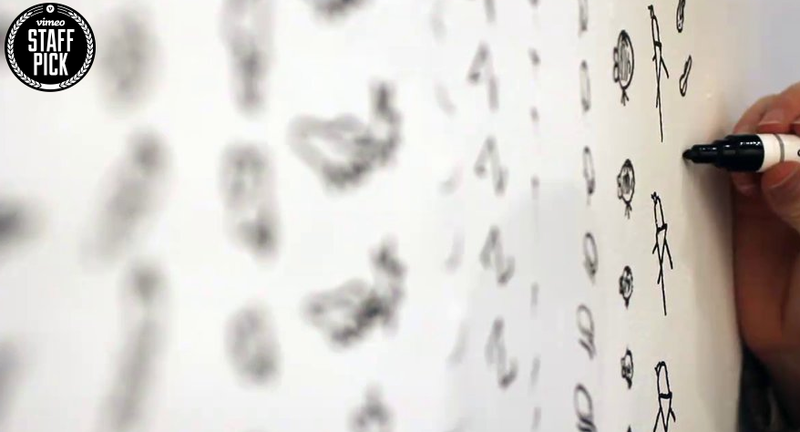 The only drawback to his animation is that the animations are very crude and raw – which in some cases is their charm. However, to do a feature film, the movement should be a lot more professional and I think I can deliver that. I was looking for a project that wasn't so labor-intensive and so complex. So I called Jim up to suggest we work together to transform his wonderful characters onto the big screen. He loved the idea – and now he's creating a feature length script that hopefully my studio can turn into a major motion picture starting this summer. Stay tuned to this blog for more updates on this fantastic project. We may need to raise some money via Kickstarter so keep your checkbooks close at hand. And tell him hello for me. 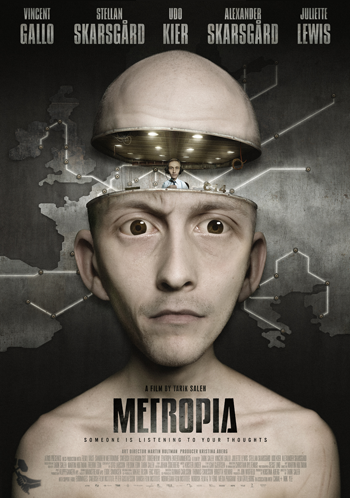 I was reading DVD reviews in some obscure film magazine last month, and I stumbled on an animated feature called "Metropia", from Sweden. I liked the dark semi-realistic visuals of the still image, so I got the film from Netflix. What a unique and amazing film! It's a sci-fi film set in a dystopian 2025 Europe. Roger, a mid-level bureaucrat, decides to track down these voices in his head, only to discover a nefarious conspiracy, spread through a giant transportation system and shampoo. 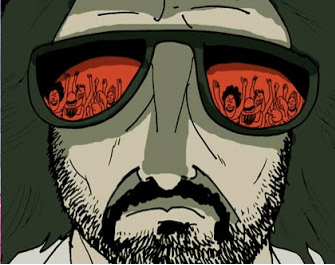 The characters in the film are voiced by Vincent Gallo, Juliette Lewis and Udo Kier, and it's directed by music-video veteran Tarik Saleh. But what interested me most was the look and style of the film. It's a digital film with very minimal movement. The lip-sync is the only real movement - except for an occasional eye-blink. And the walking is your typical Japanese animé stiff-leg walk. 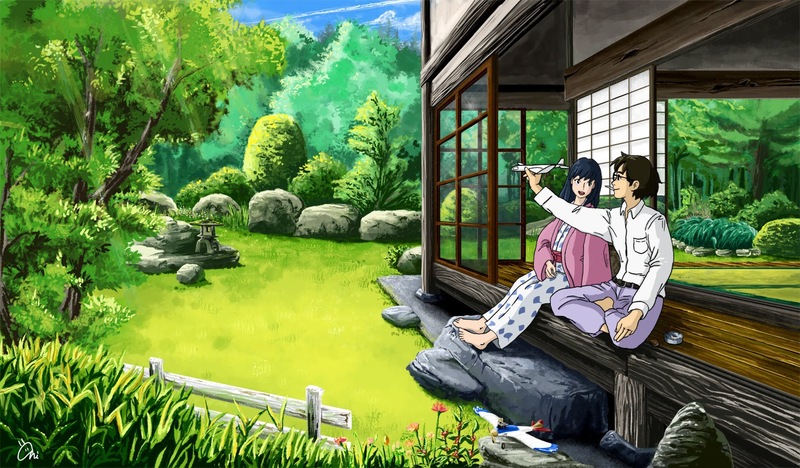 In fact, the whole film is very stiff and limited, yet I was seduced by the backgrounds, lighting and story. Of particular interest were the faces - they used real actors as models, and the resulting imagery was quite powerful. I wish this film had enjoyed a bigger release - it's really a fascinating feature film. But thanks to DVD, it's hopefully finding its audience. I give "Metropia" a "B".